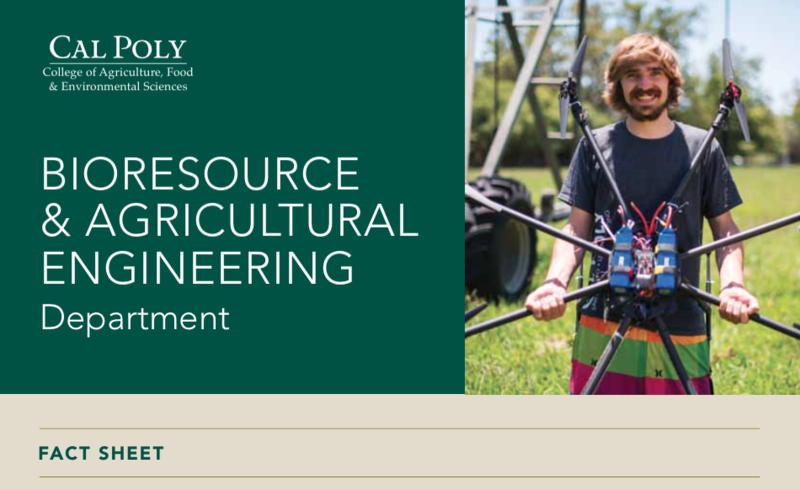 BioResource and Agricultural Engineering at Cal Poly is the study, teaching, and practice of engineering and systems management support for agriculture. From day one, our students Learn by Doing in laboratory-intensive classes. Through practical design and problem solving experiences, our students receive the skills, the tools and the opportunity to build what they design. The BRAE Department's BioResource and Agricultural Engineering (BRAE) major offers answers for students who want to be problem solvers. Today's high-tech agricultural industries are looking for graduates who can engineer solutions to the problems of resources and systems as well as for those who can manage advanced technologies. With the Agricultural Systems Management (ASM) major, students combine hands-on experience in agricultural technology with practical training in the business and management aspects of agriculture within a curriculum that is recognized by the American Society of Agricultural and Biological Engineering. In addition to the hands-on courses in the department, students may take enough business and management classes to earn a minor in Agribusiness. I’m a hands-on learner and I was drawn to BRAE’s small class sizes, hands-on learning methods and students and staff that are approachable.